A fusion of vintage style and modern technology, our antique LED filament bulbs offer energy-efficient, period ambiance to your decor. Inspired by antique bulb designs, LEDs are ideal for exposed socket fixtures like chandeliers, sconces, and socket pendants. The energy saving Vintage-Style Round Medium-Base LED Filament Bulb (5W) is a Steampunk favorite. Amber glass and 2200 K combine to offer a warm light, similar to that of incandescent bulbs. Suited for both traditional and contemporary decors, its Edison-inspired intricate filament makes it an ideal choice for exposed bulb fixtures, both indoor or out. 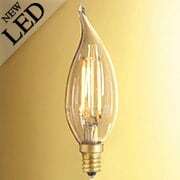 This energy saving antique-style bulb features a hard-to-find flame shape and candelabra base. 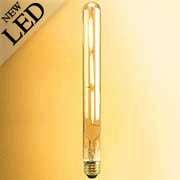 Amber glass and 2200 K combine to offer a warm light, similar to that of incandescent bulbs. Suited for both traditional and contemporary decors, its intricate filament makes it an ideal choice for exposed bulb fixtures, both indoor or out. Our energy-saving Quad Loop Filament Edison-inspired LED bulb is a Steampunk favorite. Amber glass and a 2200K color temperature combine to offer a warm light, similar to that of incandescent bulbs. Suited for both traditional and contemporary decors, it is ideal for any exposed-bulb fixture, both indoors or out. 15,000 hour average life. Fully compatible with ALL dimmer types. Our energy-saving Hairpin Filament Edison-inspired LED Tapered Bulb is a Steampunk favorite. Amber glass and a 2200K color temperature combine to offer a warm light, similar to that of incandescent bulbs. Suited for both traditional and contemporary decors, it is ideal for any exposed-bulb fixture, both indoors or out. 15,000 hour average life. Fully compatible with ALL dimmer types. 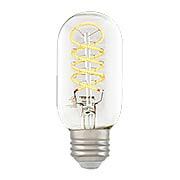 Our energy-saving Curved Spiral Filament Edison-inspired LED Tubular Bulb is a Steampunk favorite. Amber glass and a 2200K color temperature combine to offer a warm light, similar to that of incandescent bulbs. Suited for both traditional and contemporary decors, it is ideal for any exposed-bulb fixture, both indoors or out. 15,000 hour average life. Fully compatible with ALL dimmer types. 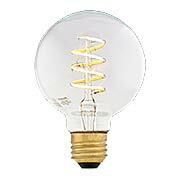 Our energy-saving Curved Spiral Filament Edison-inspired LED Round Bulb is a Steampunk favorite. Amber glass and a 2200K color temperature combine to offer a warm light, similar to that of incandescent bulbs. Suited for both traditional and contemporary decors, it is ideal for any exposed-bulb fixture, both indoors or out. 15,000 hour average life. Fully compatible with ALL dimmer types. 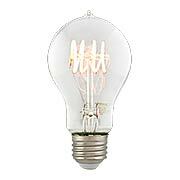 The energy saving Vintage-Style Tapered Medium-Base LED Filament Bulb (5W) is a Steampunk favorite. Amber glass and 2200 K combine to offer a warm light, similar to that of incandescent bulbs. Suited for both traditional and contemporary decors, its Edison-inspired intricate filament makes it an ideal choice for exposed bulb fixtures, both indoor or out. 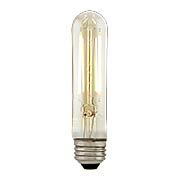 Our energy-saving Vintage Style Edison-inspired LED Small Tubular Bulb is a Steampunk favorite. Amber glass and a 2200K color temperature combine to offer a warm light, similar to that of incandescent bulbs. Suited for both traditional and contemporary decors, it is ideal for any exposed-bulb fixture, both indoors or out. 15,000 hour average life. Fully compatible with ALL dimmer types. 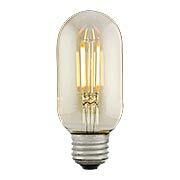 Our energy-saving Vintage Style Edison-inspired LED Tubular Bulb is a Steampunk favorite. Amber glass and a 2200K color temperature combine to offer a warm light, similar to that of incandescent bulbs. Suited for both traditional and contemporary decors, it is ideal for any exposed-bulb fixture, both indoors or out. 15,000 hour average life. Fully compatible with ALL dimmer types. 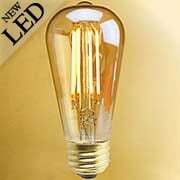 Our energy-saving Vintage Style Edison-inspired LED Tubular Bulb is a Steampunk favorite. Amber glass and a 2200K color temperature combine to offer a warm light, similar to that of incandescent bulbs. Suited for both traditional and contemporary decors, it is ideal for any exposed-bulb fixture, both indoors out. 15,000 hour average life. Fully compatible with ALL dimmer types.